I never really took the opportunity to visit Europe that much, maybe because it’s just so close! 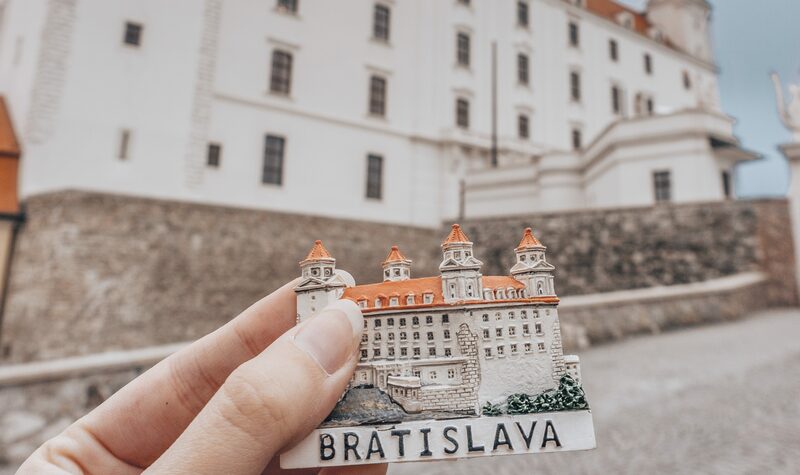 I recently had the chance to come to discover Bratislava and I absolutely loved it. The city is very small and charming but there’s a lot to see. Here’s the must seen of Bratislava! One of my top favorite thing to see. This blue church is just so special, the color is stunning and I really recommend going there. If you have time you can visit the inside, it’s just as lovely as the outside. But only if you love Blue haha. The landmark is actually a World War II memorial, but more than that, it’s located on a hill so you can see the all city. It’s a pretty cool place to visit. Well I don’t think I need to mention this one.. It’s the most visited place in Bratislava and the view is just amazing too. The Old Town is the most charming part of Bratislava, its a few walking and paved streets. All the houses are colorful and there’s where you can find most of the cute coffee place and restaurants. I think it might be the coolest place in town! First I just thought “What a weird bridge” and then I learned that you can actually go to the top and they have a bar/restaurant! How cool is it to get a drink with a view like that ? Entrance is around 8 euros, then drinks are not expensive it’s 4 euros for a glass of wine. And even the toilets has an amazing view, it can’t get better than that. This is literally my favorite restaurant in Bratislava. First of all the decoration is so beautiful and the food is so delicious. This is maybe the most famous franchise of Bratislava. You can even found 3 restaurants in just one street! But the food is really good, the menu has a lot of option and the place is gorgeous too! This is a small coffee place, on a small street, I almost missed it. But I loved the decoration and the staff so much that I had to put it on my list. This restaurant isn’t really downtown but if you have the opportunity to stop you won’t regret this. The place is so nicely decorated and has a little balcony so you can enjoy the sun a little bit. This city was such a beautiful discovery for me. So if you’re planning a road trip to Europe, don’t miss Bratislava!